Clifford Samuel and Derbhle Crotty in The Events. There is so much that could have gone wrong with this new play by Scottish dramatist David Greig. The ‘events’ of the title refer to the mass shooting that took place in 2011 on the Norwegian island of Utøya, a crime that is still raw and unresolved in the collective consciousness. In the age of instant internet comment, where kneejerk reactions are now the norm, any creative response to such a recent atrocity runs the risk of being either glib and crass or else earnest and worthy. Yet Grieg manages to avoid both traps and instead crafts a strange and clever drama that tackles the tough subject in a left-field manner that is witty, gripping and relevant. 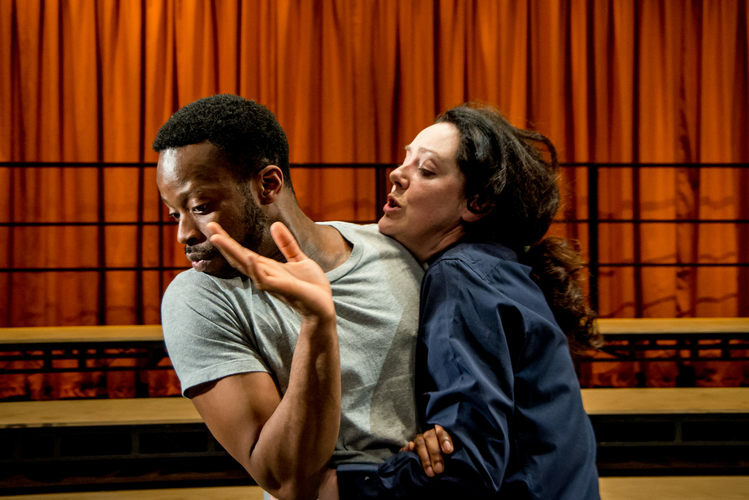 Each performance sees a different choir join two actors in the smaller space at the Young Vic theatre, the singers moving about the bare set as they punctuate a set of disparate conversations and monologues. The songs they sing are equally varied: from a Norwegian folk tune about tea and cake to shamanic chanting, traditional church hymns and an operatic re-working of Dizzie Rascal’s Bonkers. It might sound a bit mad — and it is — but it seems that sometimes the best way to understand madness is by letting the madness in. The play begins with this idea: a church choir practice coming to a sudden halt as a new arrival, The Boy (Clifford Samuel), makes his glaring presence felt. Claire (Derbhle Crotty), the village priest who is leading the activity, ignores The Boy’s hostility and invites him to join in the sing-song. And so begins a process, weaving back and forth through time, in which she tries to make sense of an individual who can’t or won’t fit in. This is the main focus of the drama — and the murders themselves are kept, for the most part, at the edges of things. This allows the play to be about a state of mind rather than a particular historical moment, ‘the events’ becoming more abstract, the approach more philosophical. As the songs overlap with the conversations about nationalism, narcissism, computer games and bonobos, you can’t help your mind moving away from the specifics of the Anders Breivik case to other, similar ‘events’ born out of alienation and extremism: the shopping mall murders in Nairobi last year or the proliferation of American college campus killings. If it’s possible to understand the psychology behind such repellent acts, this play gets closer than most to asking the right questions. And if the answers emerge as mixed-up pieces of a jigsaw puzzle that still need to be assembled, at least that’s one step closer. And it is a major achievement that stirred into this story is so much wit (which somehow never jars) and so many unexpectedly-uplifting moments. The play is directed with élan by Ramin Gray who integrates John Browne’s musical elements into Greig’s dialogue with a perfect sense of pace. On the night we went the featured choir was the Bloomsburys, who were terrific, combining seamlessly with pianist Magnus Gilljam (who plays every show). We aren't sure how the idea of a different choir each night will work in practice but the line-up looks exciting and it does guarantee an element of unpredictability throughout the run (particularly as different languages will be used). And high praise also must go to the actors — Derbhle Crotty is a bold, believable, indefatigable Claire. Then there's Clifford Samuel, surely a star in the making, playing a dozen or so parts including the gunman (and Claire's lesbian lover and a fox) without a single false note. In a summer where the clever plays are now thinning out, The Events is an idiosyncratic treat. The Events is on at the Young Vic, SE1, until 2 August 2014. Tickets £10/£19.50. Londonist saw this play on a complimentary ticket.